The ankle joint, which connects the foot with the lower leg, is injured often. An unnatural twisting motion can happen when the foot is planted awkwardly, when the ground is uneven, or when an unusual amount of force is applied to the joint. 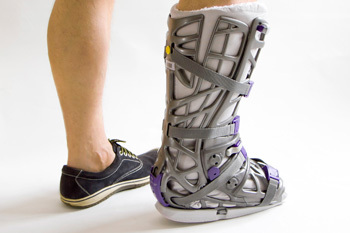 An ankle injury occurs when the ankle joint is twisted too far out of its normal position. Most ankle injuries occur either during sports activities or while walking on an uneven surface that forces the foot and ankle into an unnatural position. Sit with your foot elevated higher than your knee at least 4 times a day. Apply an ice pack 20 minutes of every hour you are awake for the first 2 days. After 2 days, use the ice pack for 10 - 20 minutes 3 times a day, as needed.